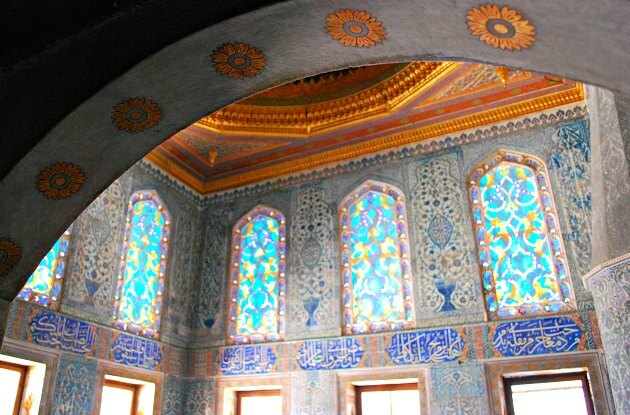 Topkapi Palace in Istanbul was the home of the Sultans of the Ottoman Empire for hundreds of years. The palace was extended over at various times in history and covers 4 courtyards with many associated buildings for the Sultans, their families, the advisors and staff. Construction began in 1459 and the site chosen, on top of a hill, has superb views over the Bosphorus and the rest of Istanbul. Your visit can include both the ‘official’ sections of the palace and the ‘Harem’ section where the Sultan’s private apartments were located. 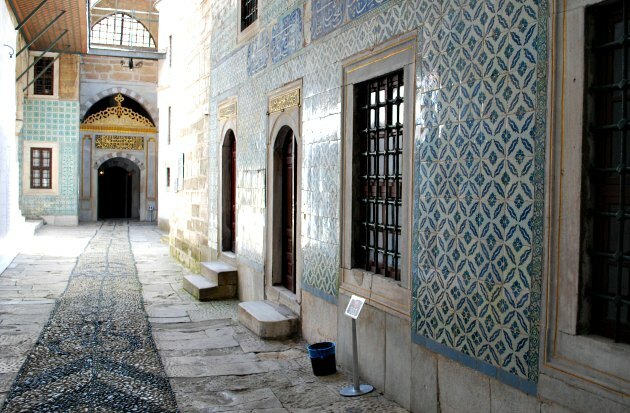 Topkapi Palace is one of the busiest tourist attractions in Istanbul and you’d be wise to arrive as early as possible so you can explore in comfort. 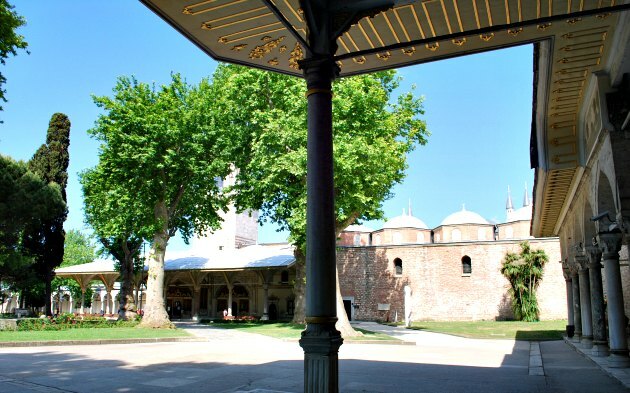 The first courtyard you come to after entering with your ticket is a large green space where you’ll find the kitchens and the buildings used by the council which advised the sultans (pictured at the top of the page). This sets the scene for the rest of your visit with each room displaying traditional Ottoman panted ceramic tiles. Each courtyard in the palace has a different feel, one contains a rose garden and another has superb views over Istanbul. The golden canopy here is where one Sultan enjoyed sitting when he broke his fast during Ramadan, and with a view like that, you can see why! Most of the interior parts of the ‘official’ side of the palace are used for displaying significant items from the palace in museum style, with lots of glass cases. We got much more from our visit to the ‘Harem’ section which you have to pay extra for. Here, there is much more of a feel of everyday life of the Sultans and their families. You’ll find mosques, bedchambers, bathrooms and private apartments for significant household members. Each of the rooms is decorated in traditional style, but they’re all different. The Prince’s apartments (pictured below) were particularly eye-catching because of the amount of light pouring in through the stained glass at the time we visited. 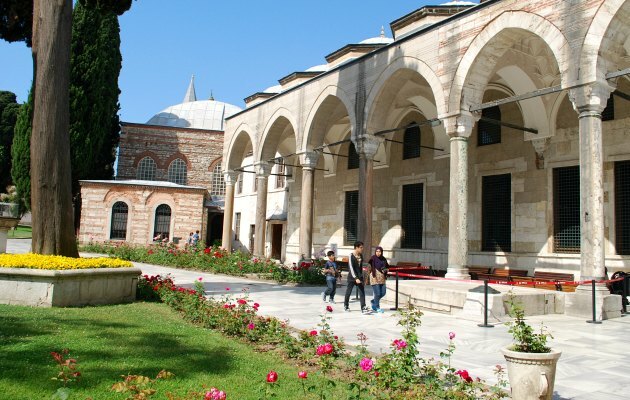 The visit to the Harem section ends in an open courtyard which overlooks a large water pool. It’s only by visiting the Harem section that you get a feel for how large the palace actually is, so don’t be tempted to save the money and miss it. We thought the palace was a spectacular piece of Ottoman history and very much enjoyed our visit. Topkapi Palace is behind Hagia Sophia near Sultanahmet Square. 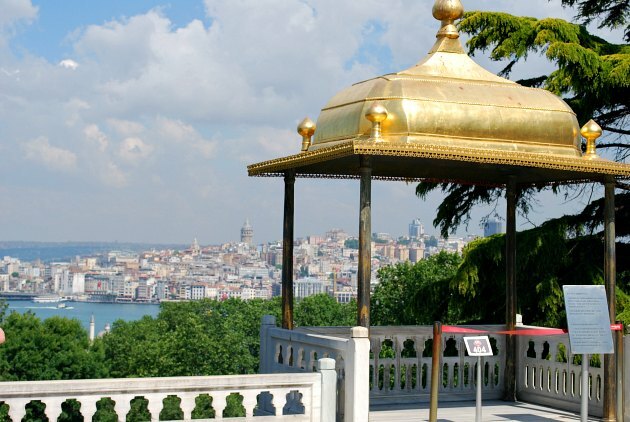 Use the Sultanahmet tram stop to get here, or the Istanbul Big Bus Hop-on, Hop-off Tour.